Nintendo, the popular video game company, recently announced their new series of products – Nintendo Labo. No, it is not a new gaming console or a video game. Nintendo Labo is a series of DIY cardboard toys that can be combined with Nintendo Switch to give an all new dimension to nintendo games. The new Nintendo Labo will be released worldwide on April 20, 2018. In this article, we will take you on a quick tour of the Nintendo Labo, it’s price and features of both the Nintendo Labo kits to be available in the market soon. You will also learn how to build nintendo labo kits and play with your Nintendo Switch. To save your time, we have also included best deals to buy your own Nintendo Labo kits. First of all, for those who missed the news, here’s a quick introduction of Nintendo Labo. Check it out! Nintendo Labo is a unique concept of toys made of cardboard which you can assemble yourself using the simple cutouts that come in different shapes and forms. Nintendo is calling these DIY cardboard toys “Toy-Cons“. These combine the magic of Nintendo Switch with the fun of creating your own toys. Nintendo is branding this concept with the tagline “Make. Play. Discover” to let the kids discover the joy of creating and learning some concepts of physics too! Definitely, Nintendo Labo is pretty cool thing for kids to have fun! Let us just remind you about a similar concept – ‘Google Cardboard, an inexpensive cardboard VR headset’ – that Google came up with in 2014. Along with these, there is a supplementary Labo Customization kit consisting of handy materials like stencils, colored tapes etc. using which you can customise your labo creations. Sounds cool, right? We can sense that you are already quite excited about it and want to know nintendo labo kit price, features etc. Don’t worry we are now getting right to it. 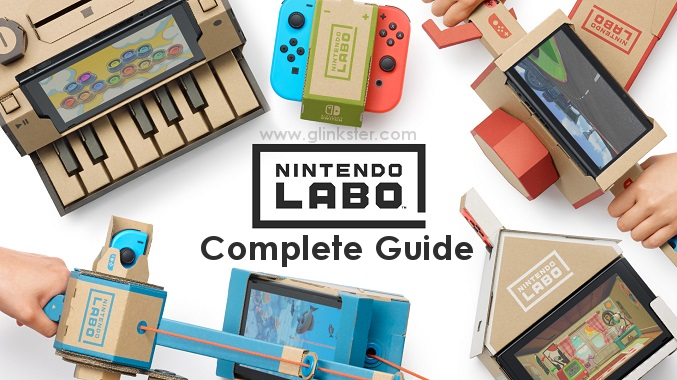 Let us have a detailed look at all the nintendo labo kits one by one and where to buy them. Nintendo Labo Variety Kit is the first of the two Toy-Cons. As the name suggests, it has variety of cardboard cutout sheets which you can make into a piano, a house, a fishing rod and even a motor bike! And all these get powered up when you connect your Nintendo Switch as per the instructions on each of the 28 cardboard sheet of this labo kit. The kit also includes Reflective sticker sheet, Sponge sheet, Strings, Grommet set and Rubber bands to make the toy-cons working. A separate Labo software is also provided with each Nintendo Labo kit. With this combination, you get to use these toy-cons to control various games giving an augmented reality experience for kids. You must be wondering what different things you can make with this kit. Well, below are the details of all 5 Toy-con projects you can make using the Nintendo Labo Variety Kit. Toy-Con House: Kids always love building houses and Nintendo takes this to a whole new level with Toy-con house. Kids can easily build an interactive cardboard assembling the cutouts themselves. There are sections where you needs to insert the three piece console. Using Nintendo switch, kids will be able to actually introduce new items in their in-game house visible on the display. Toy-Con RC Car: Another favorite toy of kids is a remote controlled car and with this labo toy-con, kids will be able to make their own remote controlled car and play which can be controlled using the Nintendo Switch. Ain’t that fun? Absolutely it is. Toy-Con Fishing Rod: Outdoor fishing can be a bit risky for kids, all parent would agree. But not anymore. Nintendo’s fishing rod toy-con is absolutely a kid friendly fishing rod which can assemble themselves. It allows kids to play an awesome fishing game with a real-like fishing rod. Toy-Con Motorbike: Boys love bike racing games and it becomes more awesome when you get to control your bike not by mere touching & tapping. Nintendo labo motorbike toy-con makes it possible to create DIY motorbike handle using which you can control in-game bikes on Nintendo Switch. Toy-Con Piano: Listening to music is relaxing but making your own piano is absolute fun. Your kids can build up their own 13 key piano using the Nintendo Labo Variety Kit. Combining it with Nintendo Switch will allow kids to learn to play music in the most intuitive way possible. The second toy-con is named Nintendo Labo Robot Kit. This is an absolute dream come true for not only kids but even adults! 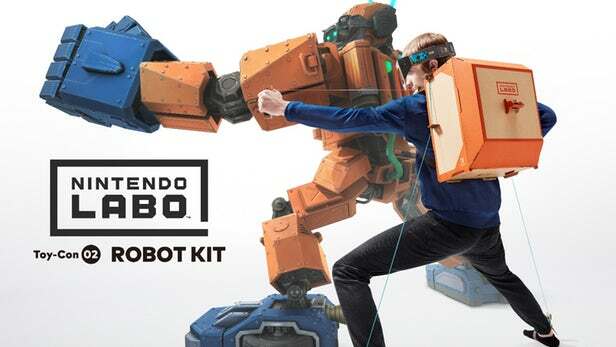 Nintendo’s Labo Robot kit is actually a wearable backpack along with headset that can sense all round movement of your body and replicate them in the game automatically. In simple words, it makes you land right inside the game! Like the previous kit, this one is also completely made from cardboard and you can put the whole thing together yourself. There are no complex components involved so it is pretty easy for kids to assemble it. It includes two foot pieces, two hand pieces, one backpack and one headset – all made of cardboard. 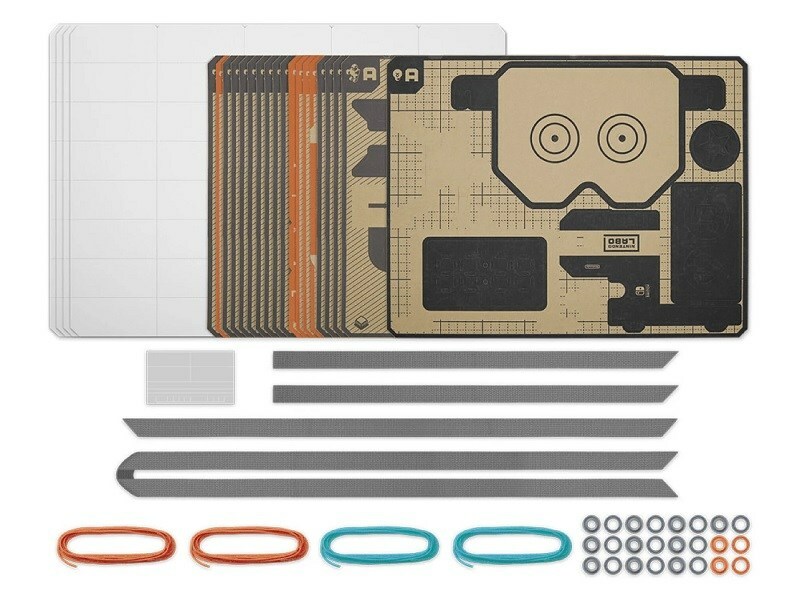 The Nintendo Labo Robot Kit contains 19 cardboard sheets, 4 cardstock sheets, reflective sticker sheet, strings, grommet sets and canvas straps to wear the backpack. Also, a standalone robot kit software is provided to get you started. So, these were the two main nintendo labo kits going to release in April this year while the pre-orders have already started! But wait, there is some more to come. Check out the third surprise labo kit below. 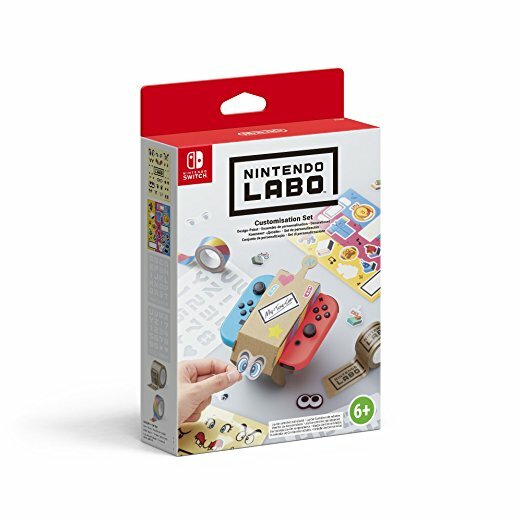 Along with the Variety kit and the Robot Kit, a supplementary Nintendo Labo Customisation Set is also available for more creativity and do extra fun with the labo kits. Priced at less than $10, this customisation set will help the kid express their creativity and style the toy-cons in their own way. You can draw on them, color them and decorate them to add the personalised touch to your toy-cons! This set consists of a lot of stuff like that includes – two stencil sheets, two stickers sheets and two colorful tape roll with Labo logos on them. Customisation set is simply a great thing to give to your kids and let their creativity fly! With everything said, in the end, it wont be an exaggeration to say Nintendo is totally redefining the video game landscape with this new Nintendo Labo. Also, we anticipate that you will see more interactive Labo kits releasing in near future. But it totally depends on how customers accept this product. The early reaction is pretty good with lot of appreciation and buzz. On the other hand, there is a section of gamers who have thrashed Nintendo for pricing it higher then the expected price. No matter what everyone says, the real figures will tell the real story after the release of Nintendo Labo on 20 April 2018. The pre-orders have already started on Amazon and you can get yours now! So, What do you think about Nintendo Labo? Do you want to have one? Share you thoughts about Nintendo Labo in the sections below!